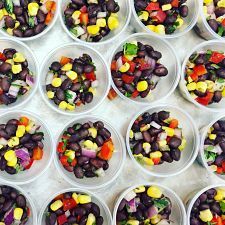 When I started working at Project Angel Heart, I knew the kitchen was doing a great job of tailoring our meals, making them delicious, and getting our clients the food they need every week. I also knew we receive and cook a LOT of food, so I would be doing some nutrition detective work to ensure every item we receive is what it appears to be. This recipe is super easy to prepare and great for your heart health as well! Using chicken breast along with a bunch of vegetables and no added salt make this recipe great for anyone looking to reduce their fat and/or sodium intake. Lots of dried spices and a little citrus added at the end enhance the flavors without salt. As an added bonus, the turmeric in the rice is a natural anti-inflammatory. I hope you enjoy this recipe as much as we do! We attended The Heart of the Matter, Medical Center of Aurora‘s Cardiac Symposium, to speak with doctors, nurses, and other health care providers about food as medicine. Project Angel Heart provides specialized meals for clients living with heart issues, which focus on carbohydrate control, low saturated fat, high fiber, and low salt.